Hello Peter, you’re launching Brewer’s Eye at IMBC. Can you tell us about what the app does and how it can benefit both drinkers and brewers alike? Over the past year we have been speaking to both Beer Lovers and Brewers from New Orleans to Melbourne and everywhere in-between to understand the risks, challenges, opportunities and needs that exist in the industry – a big thank you to all the amazing people that we have met so far. From these conversations we have founded The Brewer’s Eye, which is a unique beer platform made by Beer Lovers and Brewers, for Beer Lovers and Brewers. Our mission is simple; The Brewer’s Eye will enable all Beer Lovers to get closer to Brewers and their awesome beers, tap rooms, events and inclusive locations than ever before. We want to find out what all you Beer Lovers enjoy so we can help breweries grow and suggest some beer related awesomeness that we know you will love too. Whether you want vegan friendly or gluten free, juicy hop bursting DDH IPAs or coffee stouts, dog friendly or disabled access – we will find the beer, brewery and location that is perfect for you (of course there are lots more filters available on the app!). Some Beer Lovers are now viewed as fans, likened to those who support a team or a club. They love certain beers and brewers but are unaware of where to find their favourite beers or that there are fantastic breweries hidden under some railway arches close to their house – The Brewer’s Eye will be a Beer Lovers best friend and allow them to enjoy beer the way that they want too. The Brewers Eye will provide Brewers unparalleled reach to Beer Lovers who have drank their beer before and who have not, who have visited their tap room and who have not, who know they exist and those who do not – The Brewer’s Eye will seamlessly connect Beer Lovers to Brewers and vice-versa. We are launching our Beta platform at IMBC and will have a demo area for all Beer Lovers and Brewers to test, play with and provide feedback. 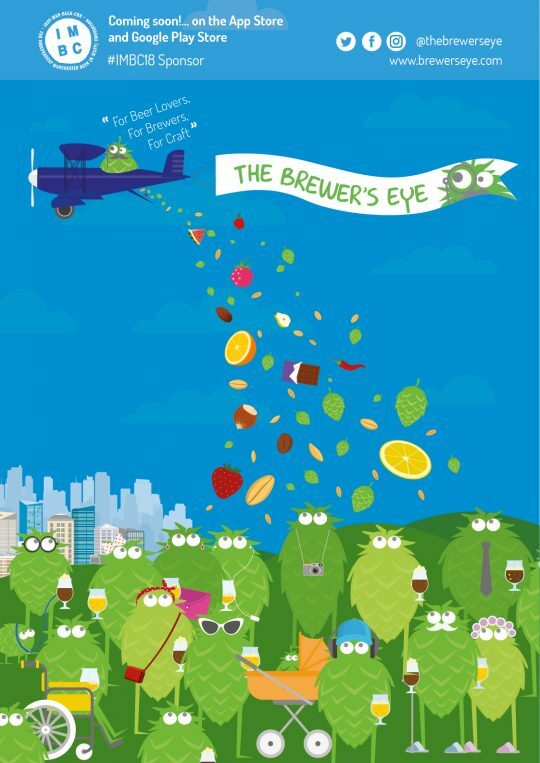 Making The Brewer’s Eye work for everyone is our goal, therefore during the IMBC festival everyone who signs up at our landing page (www.brewerseye.com) will become TBE Patrons and have a say in the future direction of the app and lots more cool stuff. What are your hot tips for visitors to the city during IMBC weekend? Order a roast dinner at Marble Arch, there are not many better pubs in the UK. Play darts at The Smithfield Tavern and then pop to the Mackie Mayor next door if you’re hungry. Wander off the beaten track around Piccadilly and check-out some of Manchester’s best breweries. Download the Beer Adventures app to help or just get a little lost, make sure you find Cloudwater, Track, Alphabet, Beer Merchants and Beer Nouveau. Pop to GRUB for some grub! Complete the (really hard) puzzle at The Pilcrow Pub over a few chilled beers. Discover the secret garden at ÖL Nano Brewery & Bar at Hatch and enjoy a beer. Venture a little bit further out to visit Sandbar for a beer and wood-fired pizza. Head to The Knott Bar where Wander Beyond beers (with lots more) can be found. Pop over to Ancoats where you can get a beer from Seven Brothers whilst waiting for a pizza from Rudy’s (the best in Manchester). Chill out at The Gasworks Brewbar and win a game of shuffleboard. Spend hour after hour at The Brewer’s Eye’s local – Port Street Beer House – which has a plethora of amazing cask and keg beers. You may be served by The Brewer’s Eye’s very own Mike so say hello and ask him about his homemade beers and bread. Unfortunately we don’t have the space to unveil all of Manchester’s gems but we’re sure everyone attending IMBC will have a great long weekend in the city. You’re going to be at the festival in person, what can attendees expect from The Brewer’s Eye setup at IMBC? We have been allocated a corner space in Room 3 above the pool. Our intention is to create an interactive area where we will allow Beer Lovers to play with the Beta version of the app, show off our future vision for the app and take feedback on what does work and does not. In addition we will of course be giving away some freebies, signing Beer Lovers up to join our journey and will have a number of polls that we need all Beer Lover’s assistance with – such as choosing our next feature, who our charity partners should be and many more key decisions. Most importantly we have our ‘Beer Lover of The Week’ feature. If you are lucky enough to be selected you will win some cool beer stuff, a space on our online blog and get to feature on our app. We will be running some competitions for IMBC patrons to win this prestigious title and the cool prizes so make sure you come and visit us at the festival. You’ve already been working closely with some breweries in Manchester. What are you looking forward to about being side by side with some great local, domestic and international breweries at IMBC 18? That’s right, we’ve been working with some of Manchester’s and the UK’s best brewers, who have been instrumental in The Brewer’s Eye from the start. We have also travelled across the globe and have been fortunate to meet a lot of awesome international brewers. What was instantly obvious at home and abroad is the value that The Brewer’s Eye will add to breweries of all sizes, and Beer Lovers, wherever and whoever they are. Honestly we are pretty star-struck and cannot wait to share the festival with these Beer Legends. These are the folk that produce phenomenal beer for us all and are the heartbeat of the industry; without these extremely talented and passionate people we cannot drink awesome beer at inclusive environments and we would not have the 1/3 pint glass – remember as you walk around IMBC to raise your 1/3 glasses to the Beer Legends and say cheers! The Brewer’s Eye was created and exists to help Brewers and we cannot wait to introduce them to what we are doing – we obviously can’t wait to drink a lot of their awesome beers too. Any hints on how to approach a session at IMBC? We take it you’re no stranger to beer festivals! The Quicky: Drink third after third after third without scoping out the area, the brewers or the beers on offer. You enjoy the beers, meet some cool people and have a great time but before you know it you’re seeing two thirds instead of one and are heading for a quick exit without last orders being called. Unfortunately you don’t remember too much the next day about the beers or brewers but have your photo library and leftover tokens to solve some of the puzzle. The Chiller: Play the long game and you are here until last orders. You get a third from a brewer you know so that you can go and scope out the festival. On your way around you meet Beer Lovers and stop to talk to Brewers – in no rush and whoever you’re with knows you’ll be back at some point. Once a lap of the festival has been completed you either go for one more or find a place to set up camp. From base camp you journey to the Brewers that you met earlier and enjoy an evening of awesome beers, music and food. The Value: Drink the strongest beers you can find and realise – either immediately and/or the next day – that this was not a great approach! You’re at risk of not enjoying flavours, not seeing the end of the night and having a tremendous hangover the next day…tread carefully. The Scientist: Before arriving at the festival you know everything that you want and where to get it. As that classic beer festival saying goes “Fail to prepare or prepare to…fall into one of the other three categories”. You have an awesome time meeting some cool people along the way and to you success is completing your pre-prepared beer and brewer checklist. No matter which approach you decide to adopt – make sure you get out there, talk to the brewers and most of all – have a good time. P.S. Please and Thank you are mandatory! Where can we follow your progress online? Everyone can sign up for updates and follow our blog at www.brewerseye.com. We also have social media and can be found @thebrewerseye on both Twitter and Instagram. By following us you will be able to discover what The Brewer’s Eye looks like, its first set of features and much more beer related greatness. Remember – All Beer Lovers who sign-up at www.brewerseye.com before 14th October 2018 will have a say in the future direction of the app and lots more cool stuff. CHEERS PETER! SEE YOU IN THE POOL! Great blog Pete. Are you coming up to the NE anytime soon, we’d love to have you attend one of our local beer festivals- Wylam Brewery are doing an International Craft Beer event in early October, let’s hook up!